Barclays Premier League Team of the Week: Matchday 32: Eden Hazard of Chelsea and Manchester United trio made the list including Raheem Sterling of Liverpool. As we approach the latter stages of this exciting Premier League, each match from here on now is crucial for teams, at the same exciting and nail biting for the supporters. With some individual brilliances and big matches played this week. 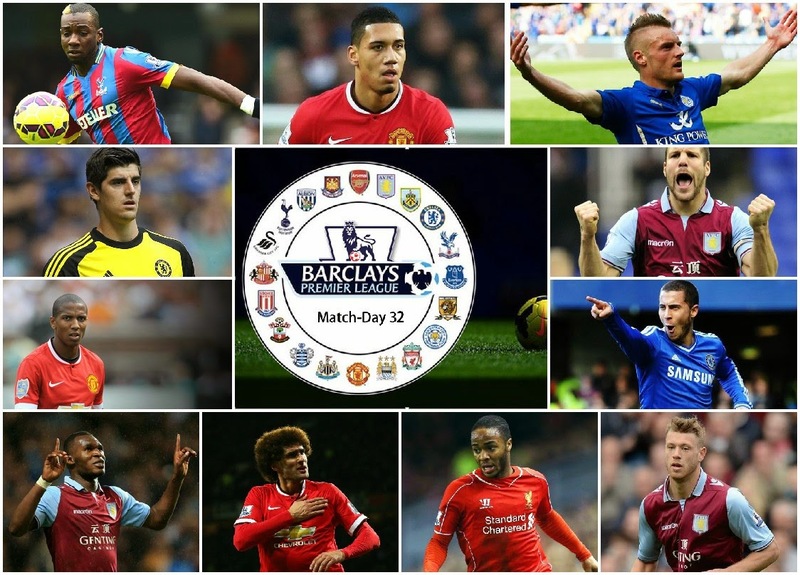 Let’s take a look at the Premier League team of the week. Thibaut Courtois of Chelsea: Made some smart saves and kept a vital clean sheet. A commanding performance from the Belgian to ensure that Chelsea are one step closer to attaining the Premier League. He has been a key player for the Blues this season with his impressive shot stopping. Ron Vlaar of Aston Villa: The Villa skipper put up an impressive defensive display to ensure important three points for his side. Also ensured his side moved further away from the drop zone. Bullied Nacer Chadli giving the Tottenham winger no chance to go past him. Nathan Baker of Aston Villa: Came on early to replace the injured Ciaran Clark and provided great support to Ron Vlaar in warding off Tottenham attacks. Chris Smalling of Manchester United: The United defender who was sent off in the last derby, looked composed apart from the first fifteen minutes, but after that he seemed to find his groove and made some good tackles and also got himself a goal to add icing to a wonderful performance. Yannick Bolasie of Crystal Palace: Individual brilliance from the Palace winger scoring a quick-fire eleven minute hatrick. Caused problems for Sunderland defence with his lightning pace, classy finishes from the Congoloese professional. Second Crystal Palace player to score a Premier League hatrick. Eden Hazard of Chelsea: As usual coming to Chelsea’s rescue, arguably the player of the season for Chelsea, was quick to react from QPR keeper Rob Green’s error at the dying moments of the game and dance his way into the penalty box, neat link up with Oscar to provide the winning assist to Cesc Fabregas and ensured Chelsea are one step closer to becoming the champions. Ashley Young of Manchester United: Man of the Match performance from the United player. Scoring the opening goal and providing two assists. There were a lot of questions when Young was assigned to that role at the start of the season, but he has done justice to it by putting in some sublime performances. Jamie Vardy of Leicester City: Off late the foxes have been inspiring, with now getting back to back wins, thanks to Leicester’s winger Jamie Vardy who outmuscled McCauley of West Brom to score a brilliant solo goal at the dying embers of the game and also give the foxes a valuable three points in the relegation survival battle. Marouane Fellaini of Manchester United: Credit must go to Louis Van Gaal for a finding a way to utilize the big Belgian Effectively. Put up some impressive displays in the last few matches, got a derby goal and bullied the Manchester City defence the entire match. Looking undroppable at the moment for Manchester United. Christian Benteke of Aston Villa: The Villa striker has scored five goals this week and scored the match winner in the game against Tottenham. Picking up form at the right time to ensure Aston Villa play in the Premier League next season. A boost for Tim Sherwood. Raheem Sterling of Liverpool: With all the media attention surrounding him in recent weeks, Sterling answered his critics with a superb performance against Newcastle and scoring an incredible solo goal, a sublime curling effort past Tim Krul. Had a galore of chances, could have probably scored a hatrick. Nevertheless a good performance from the Liverpool youngster.